So if you SUP on the waters of Hawaii or the Carribean or places like that, you probably couldn’t care less about falling in the water. If you’re looking to come out to Tempe Town Lake in AZ to try SUP for the first time, then it might be a different story. Now I love Tempe Town Lake and couldn’t be more grateful that we have it here in the city but it isn’t the cleanest body of water. That being said, I have no problem paddling it at all. Talking to people who are thinking about coming out paddling SUP with us, many are worried about falling into the water there and they shouldn’t be. 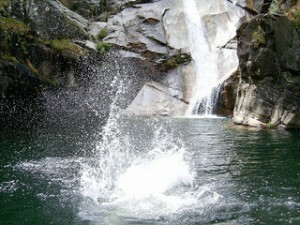 The things is, it’s highly, highly unlikely that you’re going to fall into the water your first time. Most of the times that I’ve fallen in the water were after I’d been paddling for a few weeks when I started working on pivot turns & doing other goofy stuff. If it’s your first time, the odds are that you aren’t going to be trying anything too crazy. 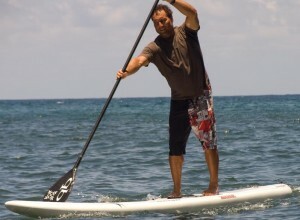 The boards that you’ll likely paddle are around 34″ wide. That’s pretty wide. Race boards can be a good deal more tippy but they are a lot narrower – down to around 25″. I’ve been on a 27″ wide board (Surftech Bark Competitor) that was definitely less stable but that’s not likely to be the board you paddle your first time. The only other people who I’ve seen have some balance challenges were heavier folks – like 250 lbs-ish. We have some pretty big boards and the rentals at Tempe Town Lake are the same. With those, you can definitely paddle safely if you are around that weight. At that point though, a bit of balance does help. As the person to board ratio goes up, you need a bit more balance and skill. Start out with a low center of gravity. We typically have friends & family start on their knees & then stand up as they feel comfortable. Your balance is much better when you have the paddle in the water. It serves as another point of balance/support. So keep paddling. Balancing is also easier when the board is moving. Same concept as riding a bike. As the board gets moving, it gets increasingly stable. 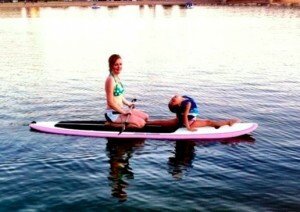 It’s also much easier to balance when the lake is still. Wind comes up in the afternoons and then dies down again in the evenings. 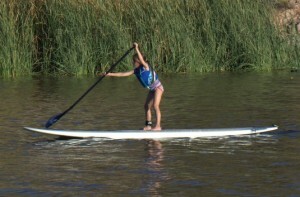 So paddle early or later if it’s your first time to enhance your chances of flat water. Also check the trees wherever you are when you’re considering heading down to the lake. If you see them blowing up top, there’s likely a bit of chop on the lake. Easiest way to fall in is waiting for someone with your board at a stop and looking back behind you. If you’re a bit uncomfortable with your balance and you’re out there & waiting for someone, drop down to you knees when you’re not paddling. 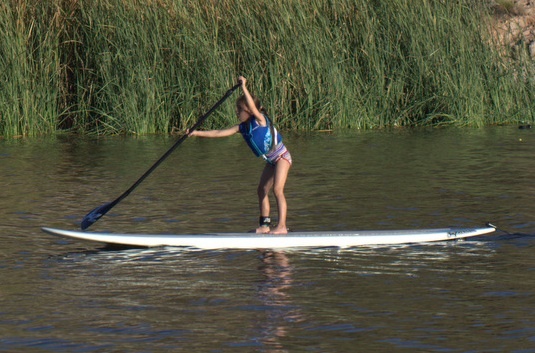 So with that quit worring about falling in to Tempe Town Lake and go SUP!